deepsouthsports.net: Is This the Peer Intervention Group? You boys ever seen that movie The Departed? Sheit, well that's exactly what Tubby is doin' to the TPD. If Ears can't win on the field recrootin' national championships, he's gonna get his "boys" in the Tuscaloosa Police department to take down Saban from the inside. Word is, Trey Blackmon was the gunman in the Julio Jones Drug Dealing buddy trial...The Louisiana Monroe loss can actually be attributed to Bill Bellacheat and his New England Patriots dressing up like the La-Monroe Warhawks and Mal Moore invented the internet. You're slackin' a bit my friend. This was Bama hater material last week. It's hard to keep up with the most current arrests and saban-scandal. Sorry. good to see you turned off E! and started watching Fox Sports. That po-po cruiser is money. attention barners: johnson's charge is being dismissed. just thought you might want to know that. 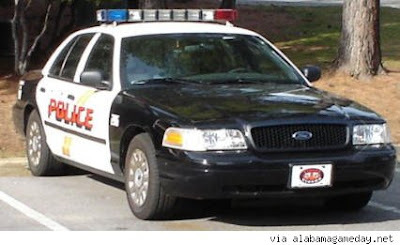 Hmm...If the police in T-town are Barners, I wonder what law school all the Judges and Attorneys went to? "We hereby drop all charges leveled against this fine, upstanding honor student and team captain, as you all repeat after me..."Rammer Jammer..."
i'm sure they graduated from the University of Alabama. Afterall it's up to the judges and attorneys to protect the Alabama players from the barners plan to sabotage the football team. So to repeat after you and finish that phrase, "Rammer Jammer Yellow Hammer, Give 'em Hell Alabama!"